…but it’s International Women’s Day + Women’s History Month and I think we should talk about gender stereotypes. …this isn’t a lesson in telling kids what’s wrong or right with gender stereotypes. This is a lesson about awareness! Taking on a heavy topic like this in your classroom can be incredibly daunting. And it definitely would be easier to shy away from it all together. But taking the easy road isn’t really what teachers do. And if we are really committed to empowering students to thrive, we take on the heavy topics like gender (and race). So how exactly do you start a conversation about gender stereotypes with middle schoolers. Well you trick them you start by talking about something safe like a Disney Princess. Mulan has always been my favorite princess. She is bold. Courageous. Convicted in her beliefs. Daring. And deeply committed to family. As I watched Mulan as a kid, she taught me how to be all of these things! But little did I know she was also exposing me to the intriguing topic of gender stereotypes. Before we go any farther let me say that this isn’t a lesson in telling kids what’s wrong or right with gender stereotypes. And it’s not meant to be an activity of highlighting only female stereotypes. It’s a lesson to help kids become aware of the fact that stereotypes, for both males and females, exist and that these stereotypes influence and impact our lives. …,stereotypes for both males and females exist and that these stereotypes influence and impact our lives. Okay, let’s get back to the activity. So to get the conversation started, we watched Mulan. 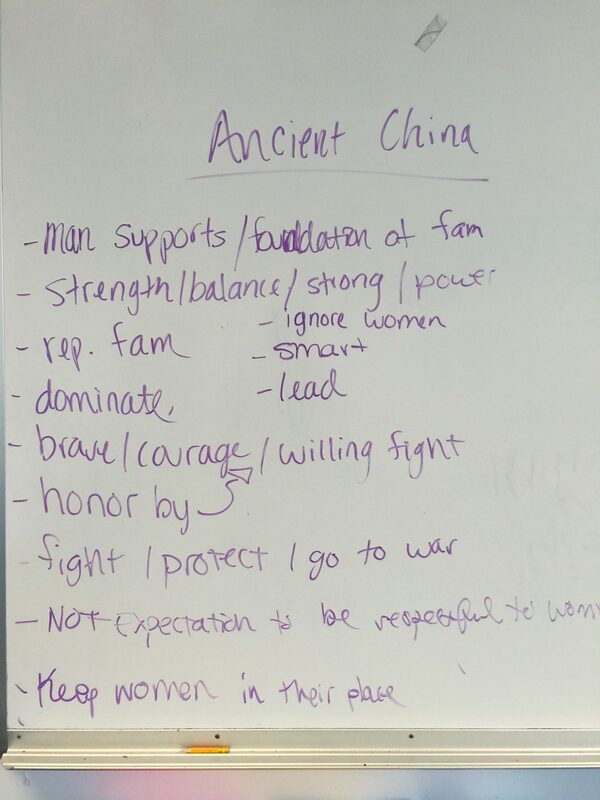 As students watched, they took notes on a table with two columns – one for the expectations of women and one for the expectations of men in Ancient China. Then after the movie, students filled out a similar table in reference to expectations of women and men in our society. Once both tables were filled out, we compared and contrasted as a class. Then we discussed gender stereotypes, stereotypes they’re aware of, the impact of stereotypes on our life, and their feelings about existing stereotypes. It’s conversations like this that remind me how wise kids are!!! Overall, this was one of my favorite topics. I am fascinated by kids discussing and taking on the problems of the world! 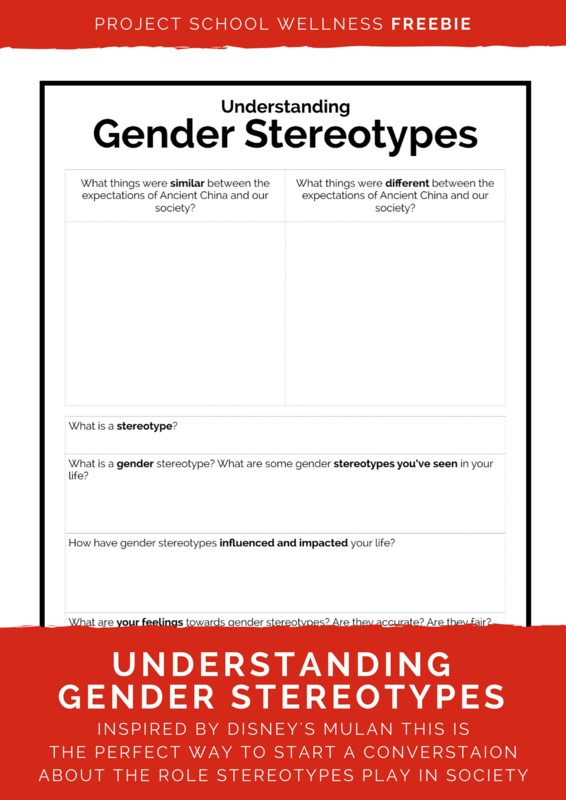 And if you’re interested in having a similar discussion in your classroom click here to watch Mulan and here to download this freebie worksheet!!! Let me just leave you with this reminder, it is important to remember that the conversation didn’t solely focus on female stereotypes. It’s very important to be aware of the stereotypes affecting both males and females and to understand how they influence and impact our well-being!